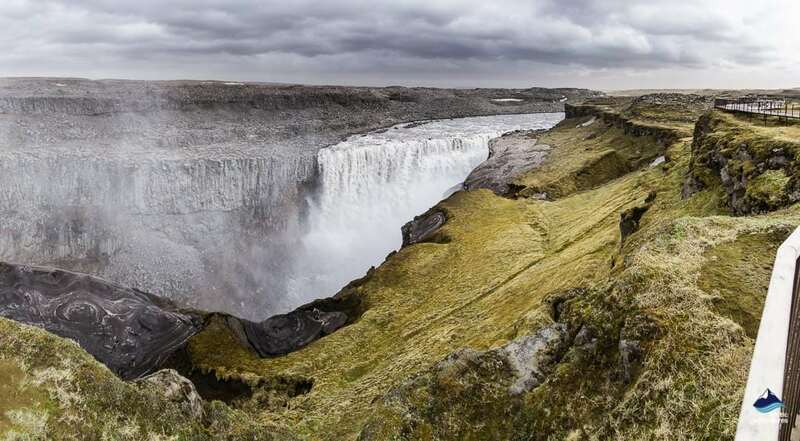 Dettifoss Waterfall is in Vatnajökull National Park on Jökulsá á fjöllum (Glacial Mountain River) is certainly the most voluminous waterfall in Iceland, flowing down from the mighty Vatnajökull glacier. Glacial sediment gives the water a slightly milky look and a pale gray color. 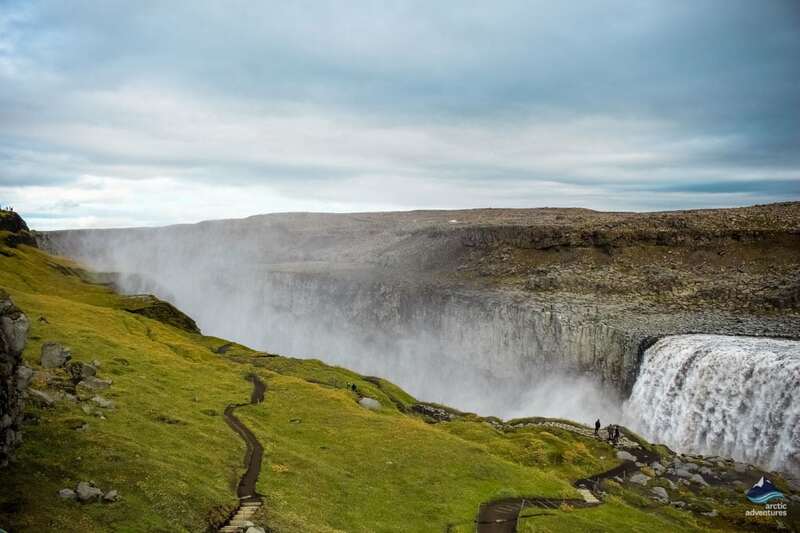 How to get to Dettifoss? 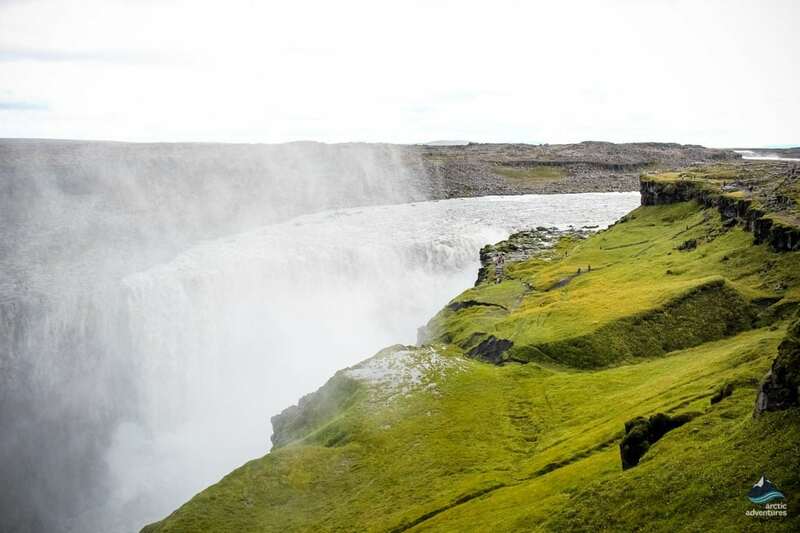 Dettifoss, the most powerful waterfall in Europe and is widely regarded as the most awesome! 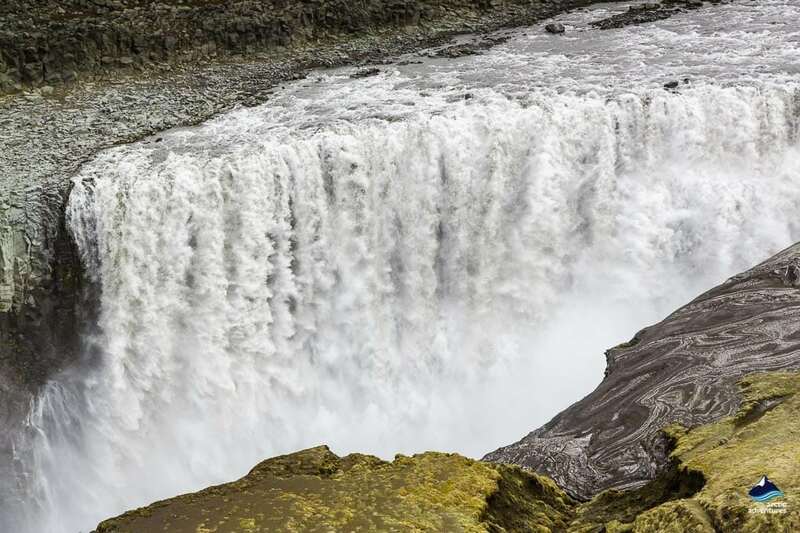 It is impossible to be underwhelmed by the thundering sound as the falls drop 44 meters (144 ft) through Dettifoss. The spray generated by this volume of water has to be seen to be believed! 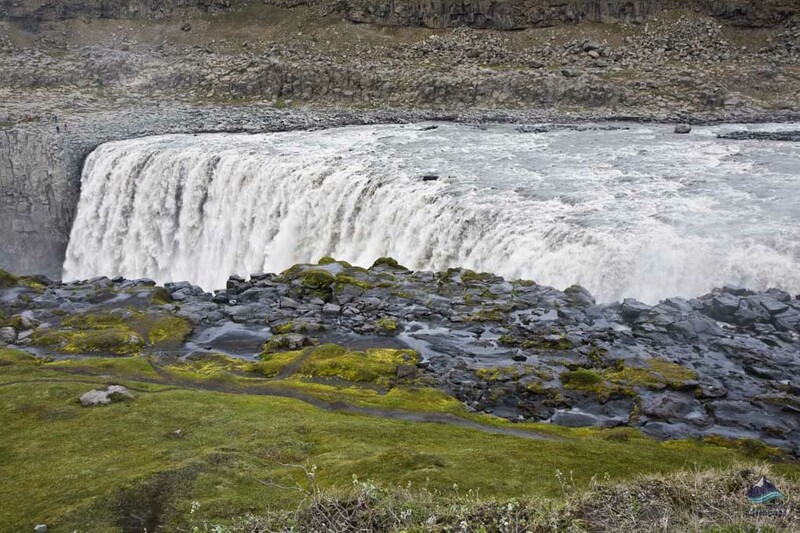 Dettifoss waterfall os one of the locations that together form the Diamond Circle of North Iceland. 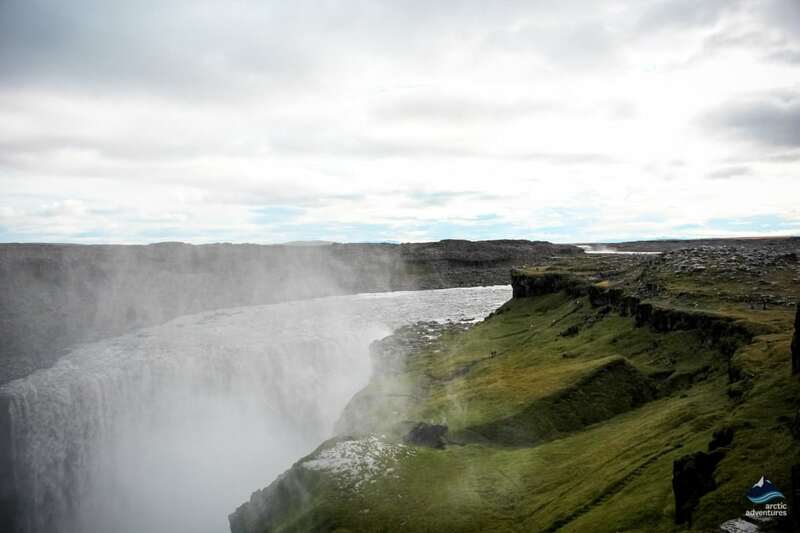 The four stops are Húsavík, Ábyrgi Canyon, Lake Mývatn and Dettifoss waterfall. There are plenty of ways to go around when exploring the thunder-wonder including a footpath down to the falls from the parking lot and a great viewing platform where you can take in all the glory. 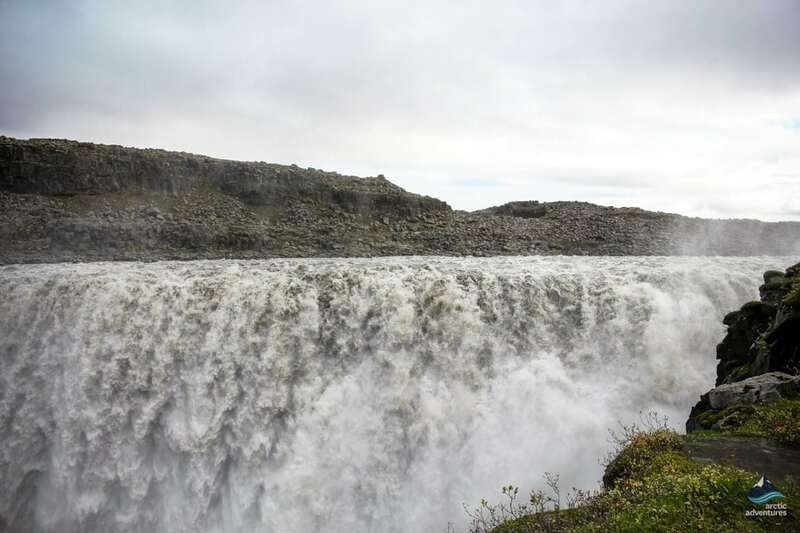 Dettifoss is a fabulously wide waterfall, reaching over 100 meters (328 ft) across a sturdy gray-colored rock foundation where it drops at the greatest force it is famous for. 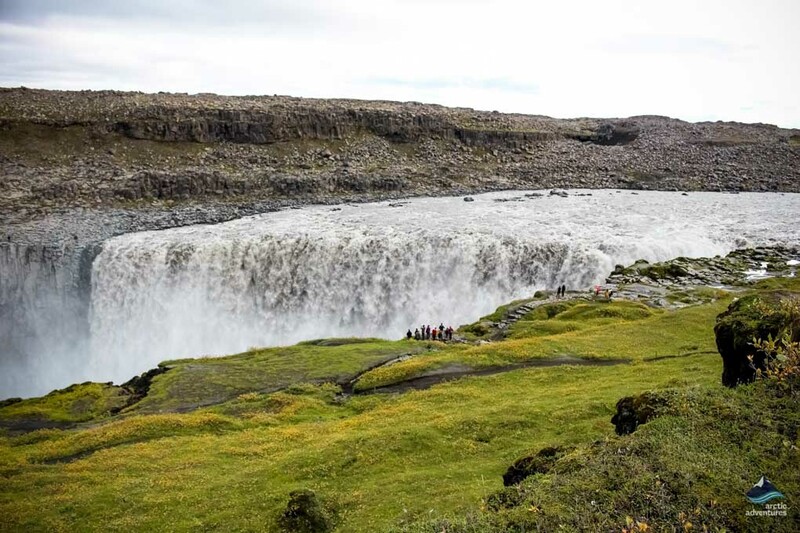 The thundering sounds of the plunge can be heard well before you start seeing the waterfall boosting the experience of a visit to another level and giving you that tingly excitement in your stomach as you approach the site. 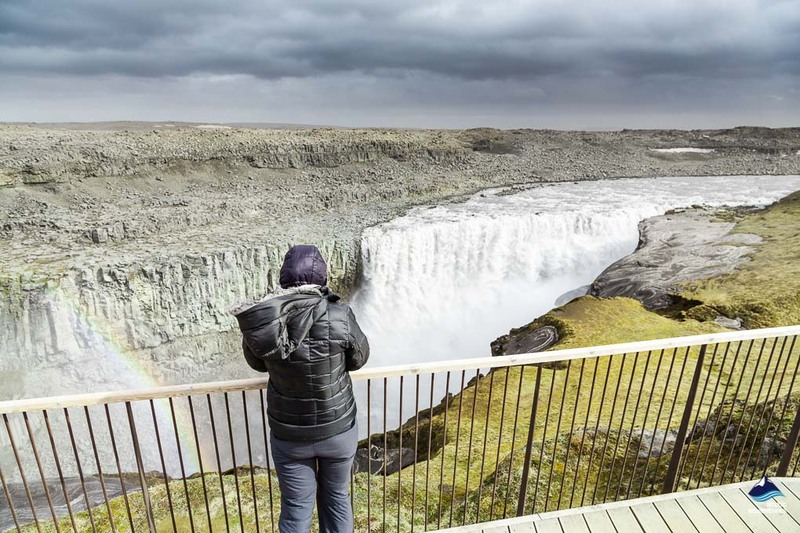 All around the waterfall you will find amazing locations and gems to explore while checking Dettifoss off your Iceland bucket list. 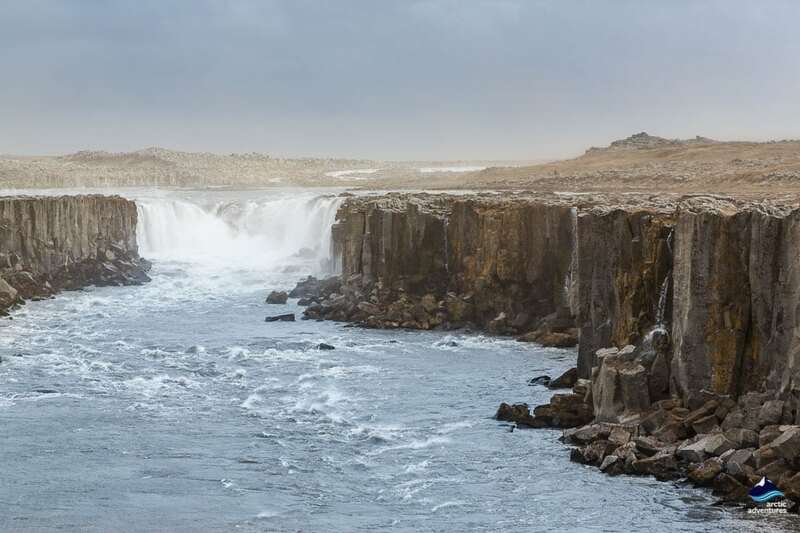 The incredible force of Jökulsá river that feeds Dettifoss creates other unimaginably pretty waterfalls such as Selfoss and Hafragilsfoss which you can visit on foot or drive only a short distance to Lake Mývatn, Dimmuborgir or some of the other pearls of the North. 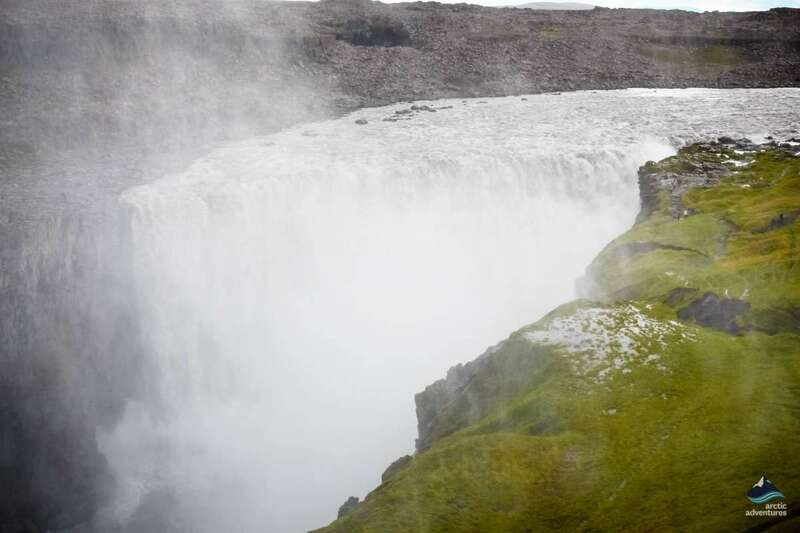 Dettifoss waterfall is located in North Iceland 530 km (329 mi) from Reykjavík in the Northern part of the greater Vatnajökull National Park. If you are traveling from Egilsstaðir in the east the distance is 163 km (101 mi). Many people stay for a day or two in the North, as there are certainly many other attractions in the area. 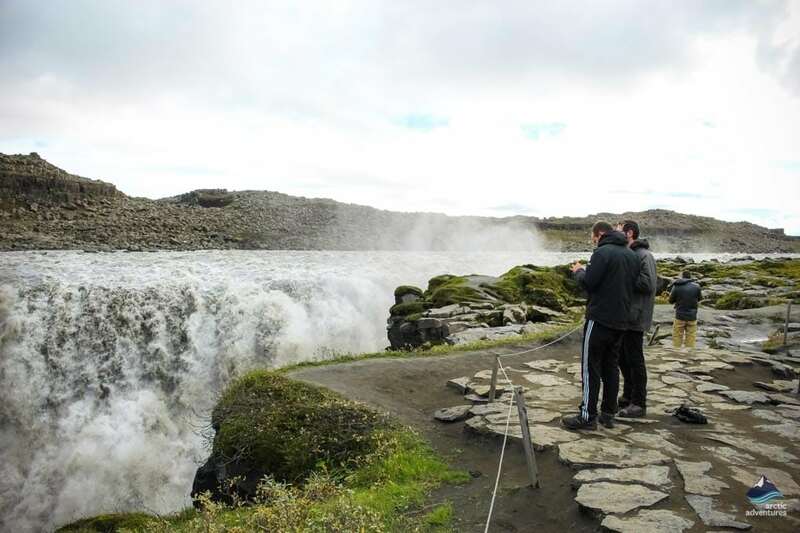 Many people base themselves in the Northern town of Akureyri, 151 km (93,8 mi) away, it is easy to visit Goðafoss waterfall on a day tour out from Akureyri. 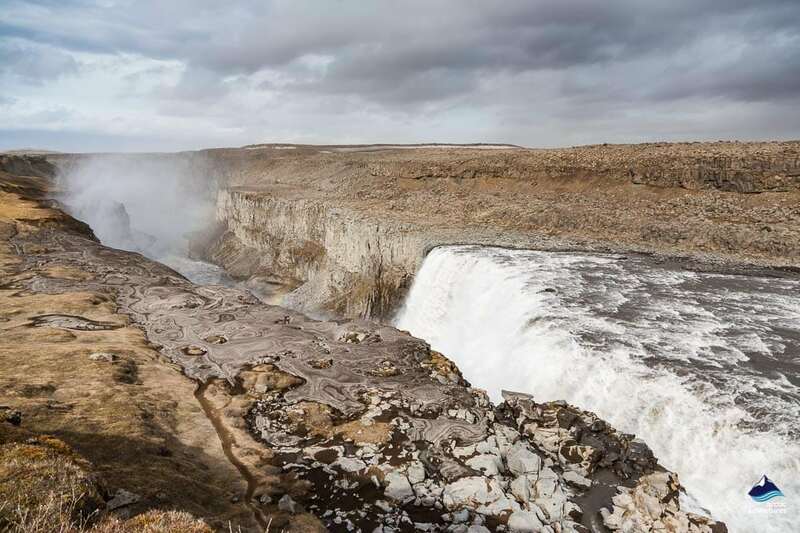 Driving from Reykjavík to Dettifoss will take about 7 hours and 6 minutes if you are driving without stopping, but we would certainly not advise this as there are so many gorgeous locations and stops you can’t miss on the way. The drive from Reykjavík is along the Ring Road 1 heading North, you will pass Borgarnes, Borðeyri, Blönduós, Húnavatnssýsla, Skagafjörður, Eyjafjörður, Akureyri and so many other interesting places but after having passed Mývatn you are going to want to start looking for the turn onto road 862, a good tarmac road which is open almost every day of the year. 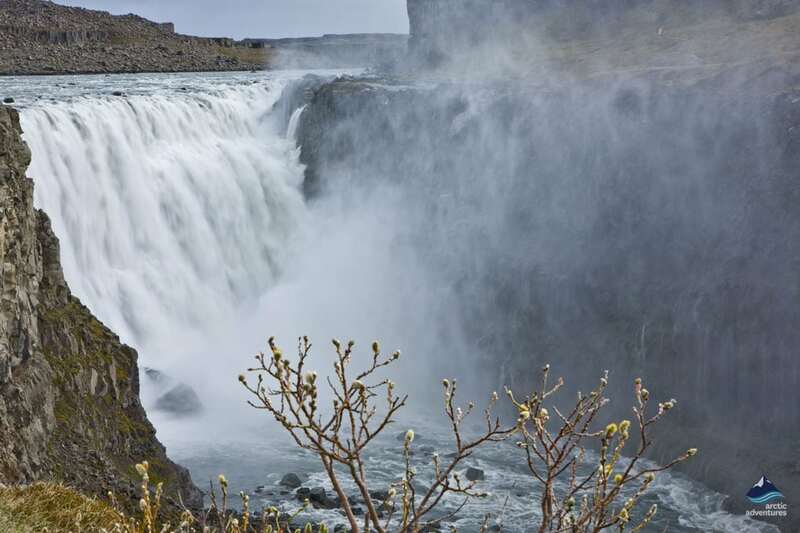 It serves the West side of the waterfall and the drive relatively short. The facilities on the western bank include a public toilet, the viewing platform and the hiking paths. There is another way to go about reaching the fall which is via road 864 called Hólsfjallavegur. This road is usually only open in the summertime and is actually a gravel road serving the east bank. You follow this road for quite some time before reaching the parking lot. The facilities on the Eastern bank are an information panel, a public toilet, and a hiking trail. 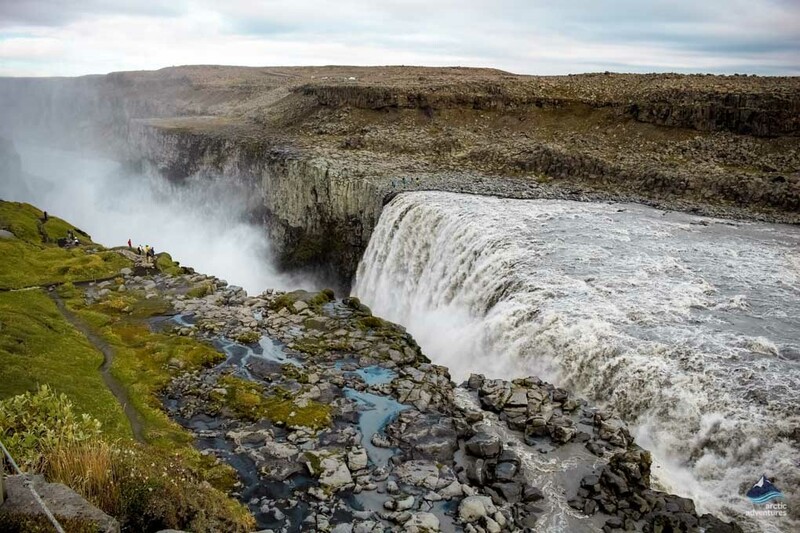 There are no hotels or accommodation to be found very near Dettifoss and that is mainly due to the fact that it isn’t located close to any town or village. 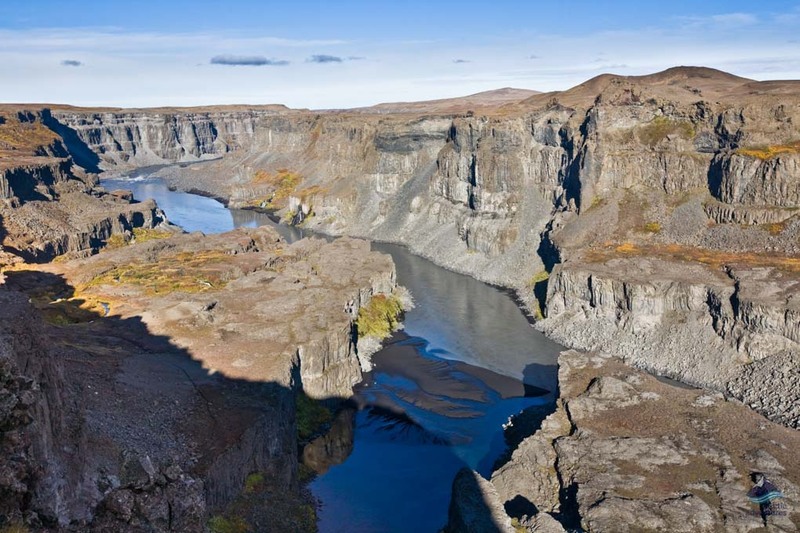 The Jökulsárgljúfur Canyon is apart of the Vatnajökull National Park and the area is inhabited but still, you can find options at farms and cabins and if you are okay with going past the 30 km (18,6 mi) radius you will find plenty. Here are a few options. 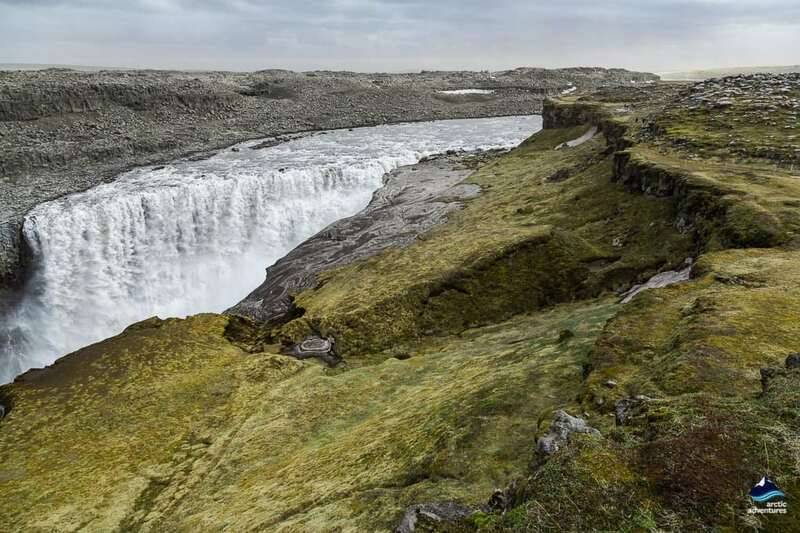 Dettifoss is fed by the powerful glacier river Jökulsá á Fjöllum that flows from the most voluminous glacier in Europe, Vatnajökull glacier. 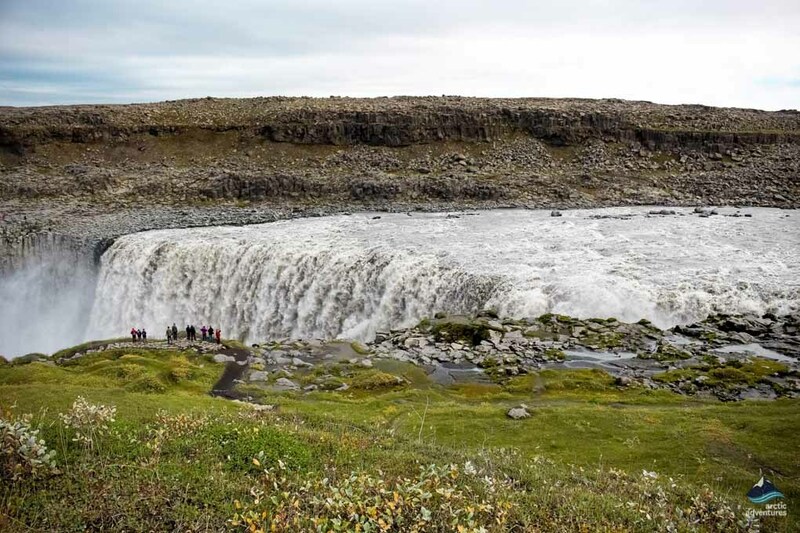 As meltwater flows from the glacier it runs through Jökulsá until it finally drops down into Dettifoss waterfall. 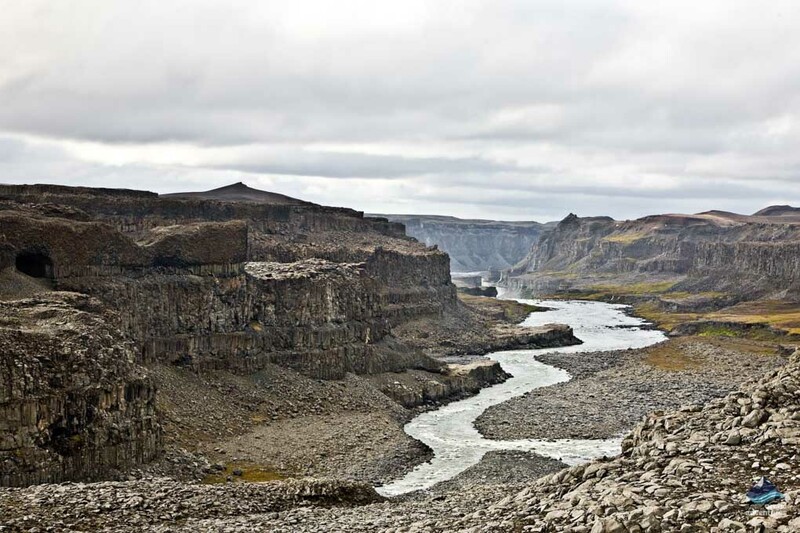 Jökulsá á fjöllum is the second largest river in Iceland and flows eventually flows into the Greenland sea. There are many paths and hiking trails of various lengths in this area and you can access the waterfall both from its east and west bank. 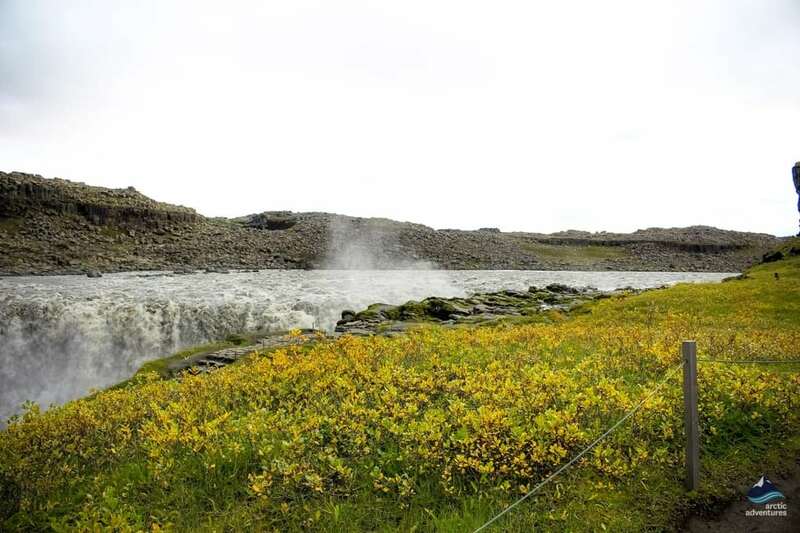 Only a short 1 km (0,6 mi) hike away upstream you will find Selfoss, another hidden water gem originating from Jökulsá á Fjöllum river. 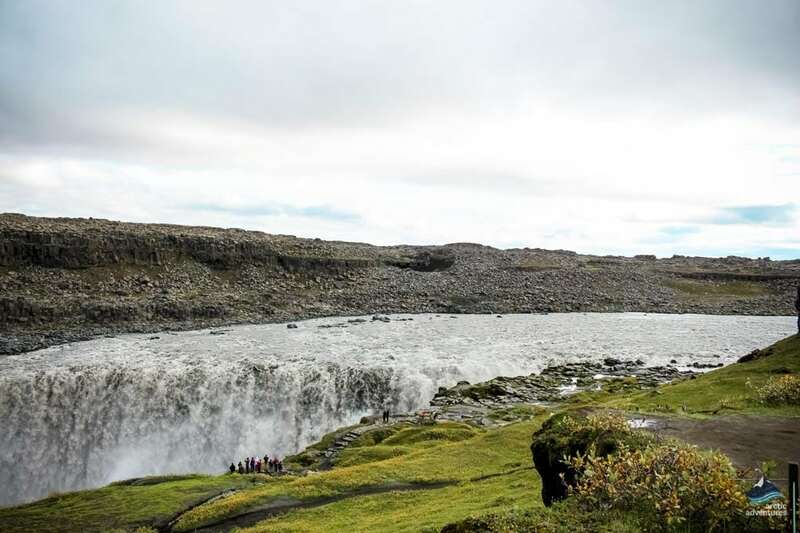 It is 10 meters (32 ft) smaller than Dettifoss but just as beautiful. 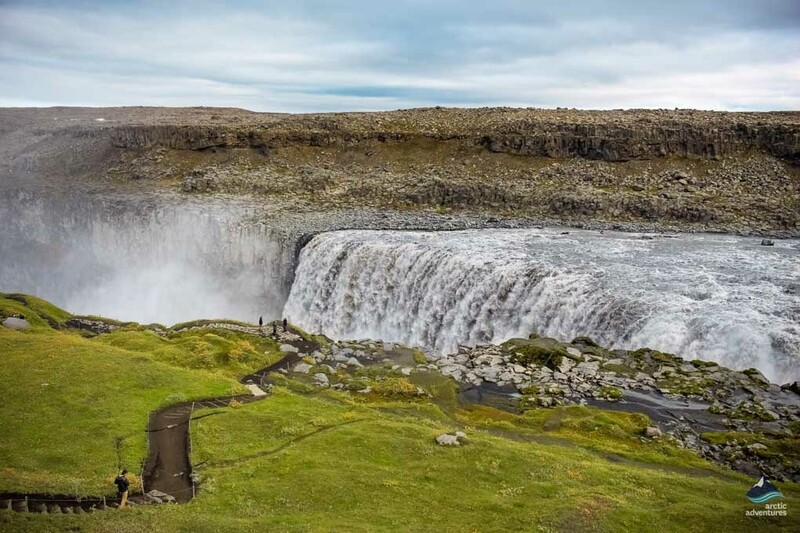 If you hike down the stream you will find yet another magical waterfall, called Hafragilsfoss which drops 27 meters (88,5 ft) into the canyon. Prometheus (2012) As often before Iceland is portrayed as another planet or the beginning of time and in this film, Dettifoss waterfall plays a role in the opening scene, where a beautiful waterfall cascades in the background as a mysterious figure sets the events of the film in motion. 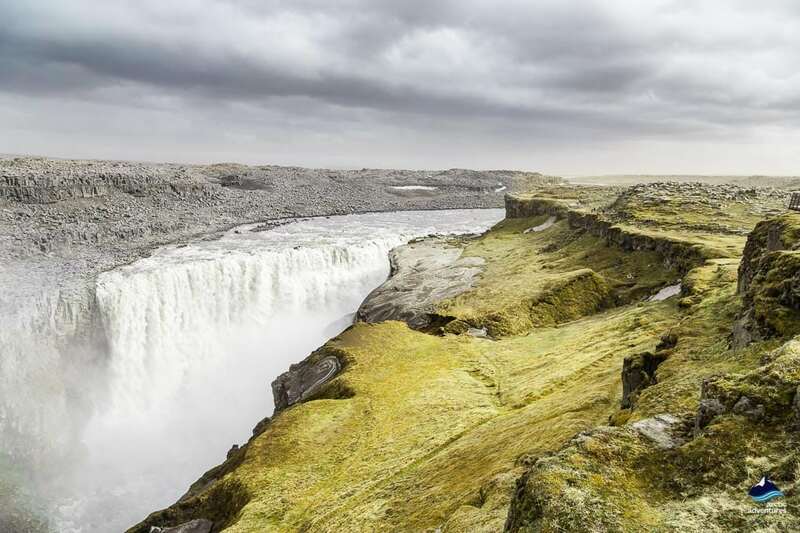 Dettifoss is a stunning sight, no matter the season, but in winter this unbelievable power source looks like something out of the Christmas Tale Storybook. Still, there are two things you need to know before visiting the falls in winter. 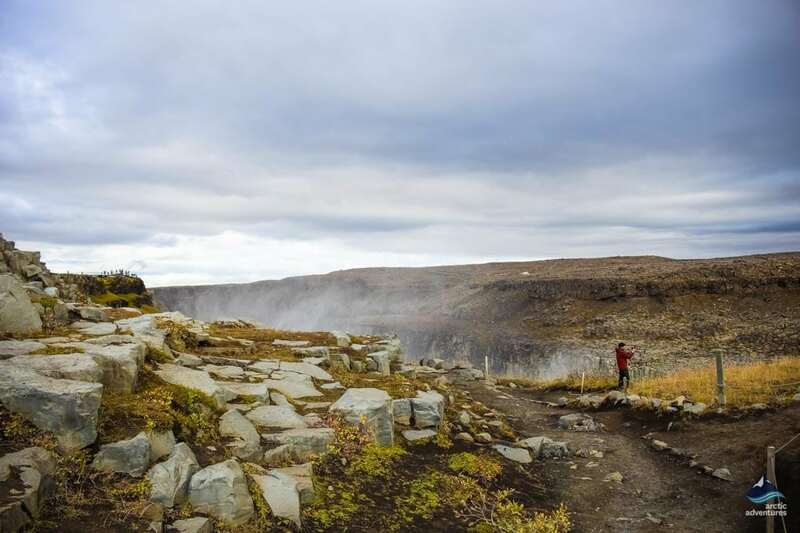 Firstly, the road leading to the waterfall might be closed due to poor road conditions, weather, snow or ice and it is important to check the website www.road.is if you are planning on driving on your own to Dettifoss in winter. 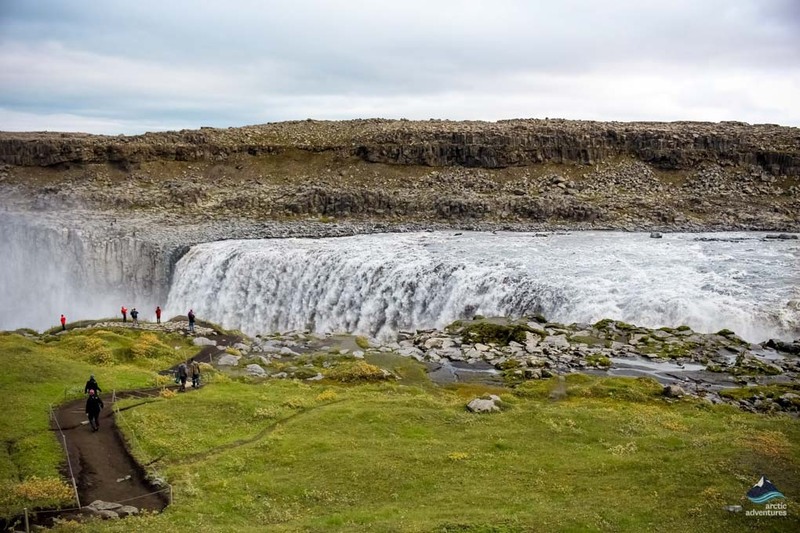 Secondly, if you are able to reach the falls you will need to be on the lookout for slippery paths and the hike down to the viewing point can be hazardous for those who aren’t equipped with proper footwear. We recommend boots with sturdy soles and ice spikes on soles for those traveling over the coldest months.